Ahtna Athabascan from the Tsisyu clan. Her parents are Nick and Lorraine Jackson. Her maternal grandparents are Hazel and the late Chief Ben Neeley of Gulkana. Her paternal grandparents are the late Tony and Mary Jackson of Kluti-Kaah. Ms. Jackson has spent the last 17 years teaching. She taught at June Nelson Elementary in Kotzebue for four years, and at Glennallen School for the last 13 years. Today, she serves as the principal of Glennallen School. 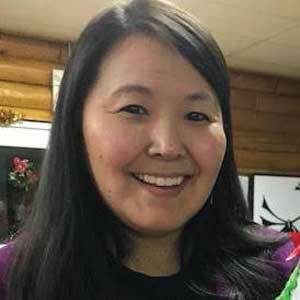 She is the first local Alaska Native to graduate from Glennallen School and later return to serve as a teacher and then principal. Ms. Jackson is an elected member of the Gulkana Village Council. She has also served on the Haskell Indian Nations University Board of Regents. Ms. Jackson was brought up living a subsistence lifestyle with Christian based values. She imparts these values in her daily life. She enjoys fishing, hunting, and cutting wood. She also enjoys being a foster mother and “Auntie” to many. Her house has always been open for children. Whether it’s for a few days or a few years, Ms. Jackson’s home is a safe place to be for those who just need a little “Auntie” time and for those who are in need. Some of the children she watches over are still in school, while others have graduated. Even though they grow up, she never stops mentoring them. Her prayer is that she will inspire children to be lifelong learners and to become educators.